— BugsInTheNews is a VIEWER-PARTICIPANT WEBSITE. This article by Jerry Cates, first published on 9 January 2012, was last revised on 8 July 2012. © Bugsinthenews Vol. 13:01(03). I live in NW Austin (near the intersection of Mopac and Hwy 183), and just found a brown spider under my bathroom sink in a container that I keep open and use to store things like my hair dryer. After carefully removing everything in the container and sealing it, I debated releasing it across the street in a wooded area. That spot is near several residences, though, and in case the spider isn’t harmless (perhaps a brown recluse?) I wasn’t sure that would be the best thing. 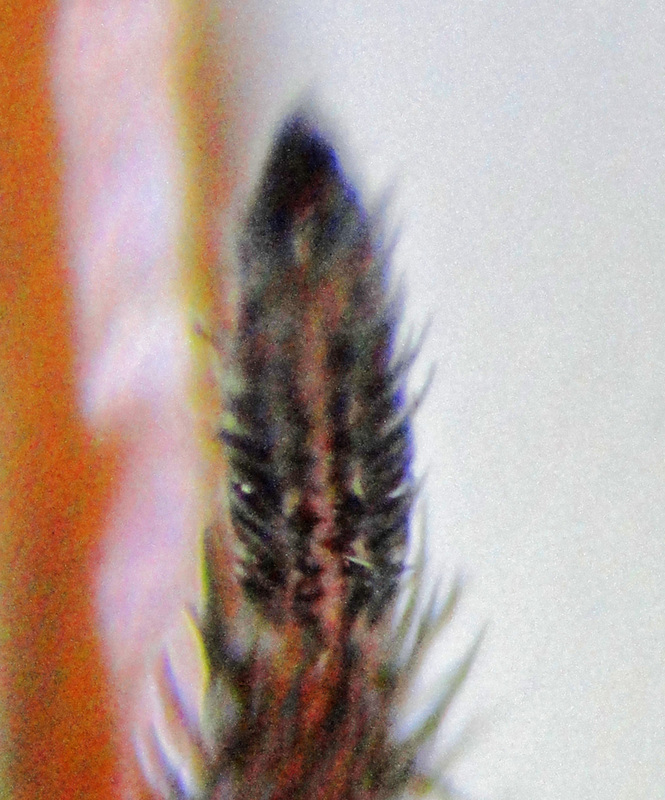 I’m attaching a picture, taken through the container, if you could look at it and tell me what it might be. Annie’s photos, not shown (all photos posted were taken under a dissecting microscope at the EntomoBiotics Inc. lab), were taken through the sides of a plastic container. 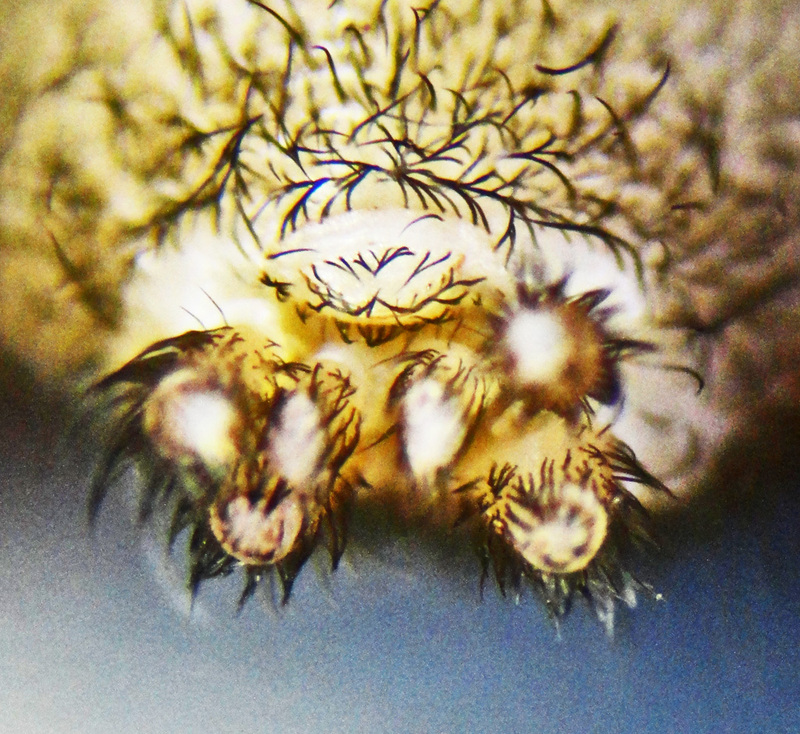 This resulted in blurred images that nevertheless showed the spider’s essential characters. Most important, Annie’s photos sufficed to ascertain that the spider was not a brown recluse. 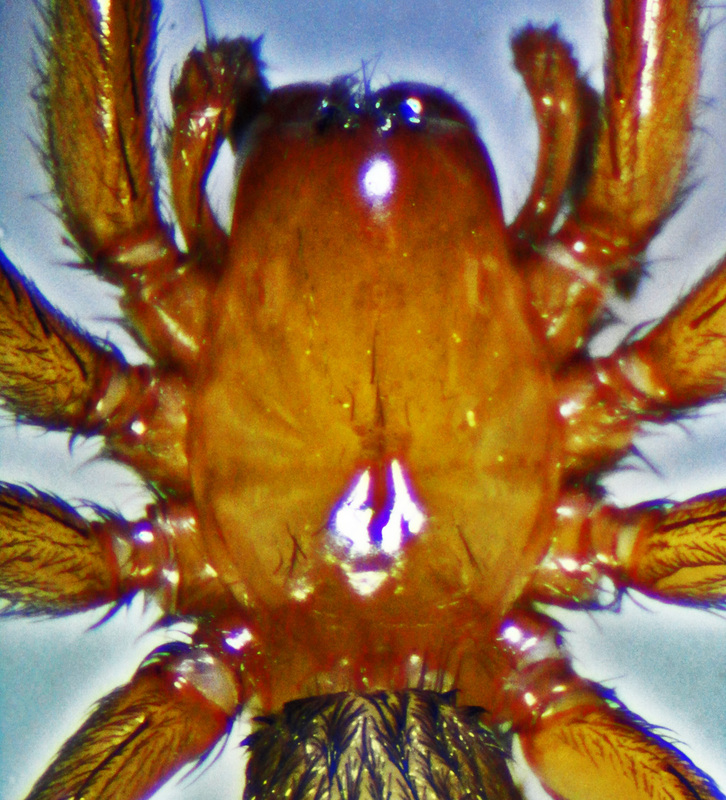 It appeared to have many of the characters of a spider in the Amphinectidae family, Metaltella simoni, which bites but is not known to produce serious medical consequences. As I’m presently studying the Amphinectidae, I asked her to preserve the spider in alcohol and hold it to be picked up at a time and place of mutual convenience. She asked what kind of alcohol was best for that purpose. That’s a complicated question, except for the overweening fact that almost any kind of alcohol will work temporarily if, as often is the case, nothing else is available. Vodka (usually 40% ethanol) is good. Everclear (95% pure ethanol) is OK, though it is better when diluted with distilled water to between 70-80%. Denatured ethanol rubbing alcohol is acceptable in a pinch, though the denaturants it contains are toxic, making it unsuitable for laboratory use. 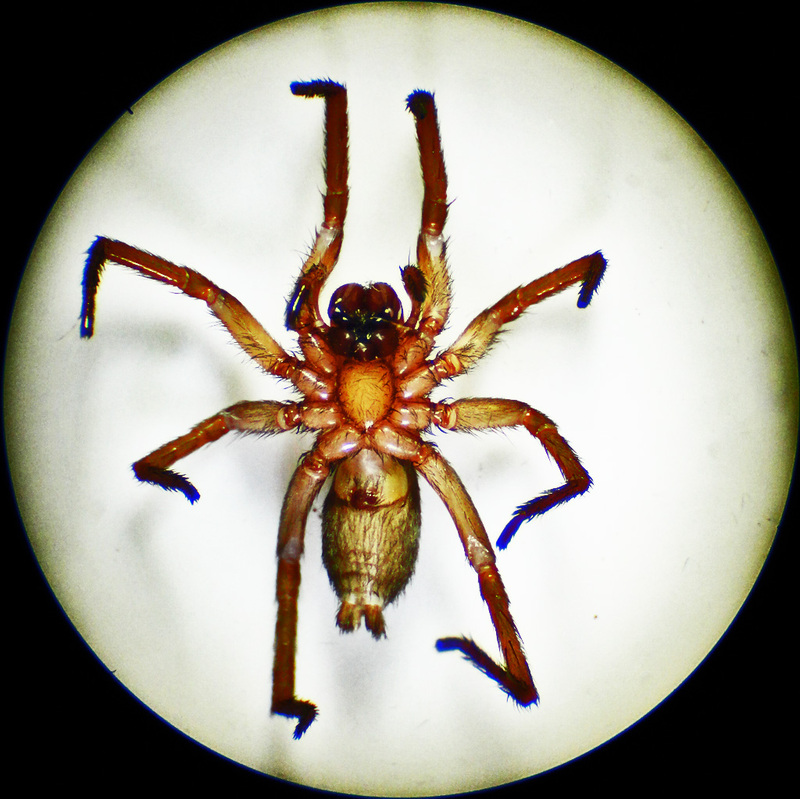 Isopropyl rubbing alcohol, though toxic in the natural state and not perfect for long-term preservation of insect and arachnid specimens for a variety of reasons, works fine for the short-term, and is what most people have in their medicine cabinets. Annie had the latter, and that is what she added to the spider’s container. We met at the Exxon Station at Hwy 183 and Burnet Road on Sunday, 8 January 2012. 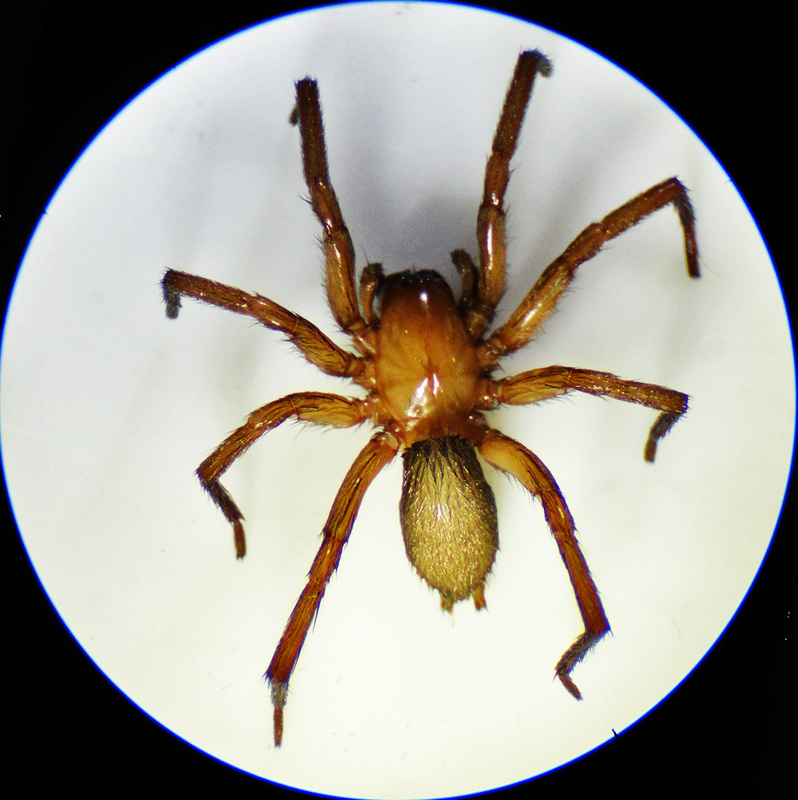 The spider, which Annie had killed with insecticide shortly after capturing it, was taken to the lab, removed from its isopropyl alcohol bath to a vial of 70% ethanol. 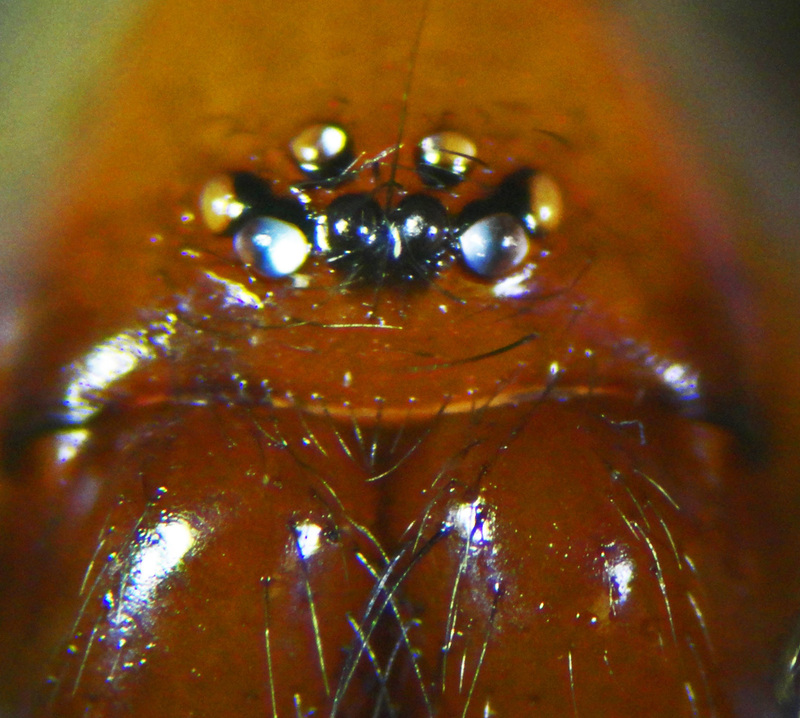 Two drops of glycerin were added to relax the spider’s body for microscopic analysis. 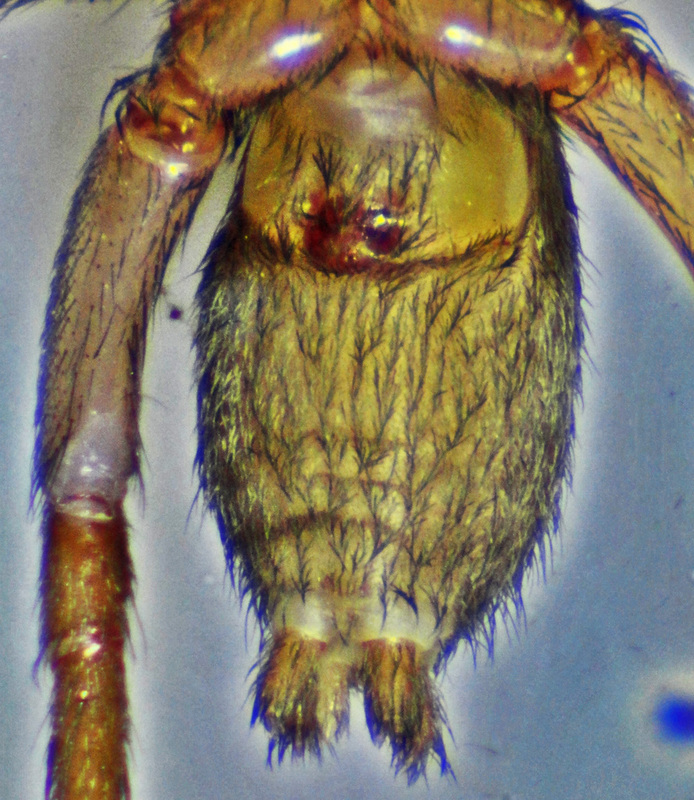 Most spiders, in the postmortem state, are presented with their legs drawn together under the body. 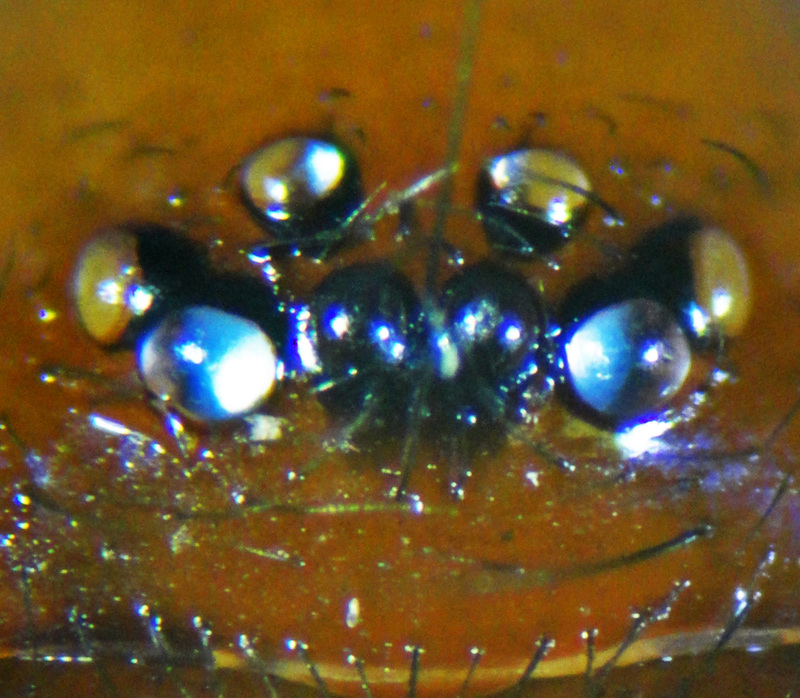 This makes it impossible to examine the ventral prosoma and abdomen without first repositioning the legs. In pure alcohol, the legs and other tissues of the body become so brittle that they cannot be manipulated without breakage. 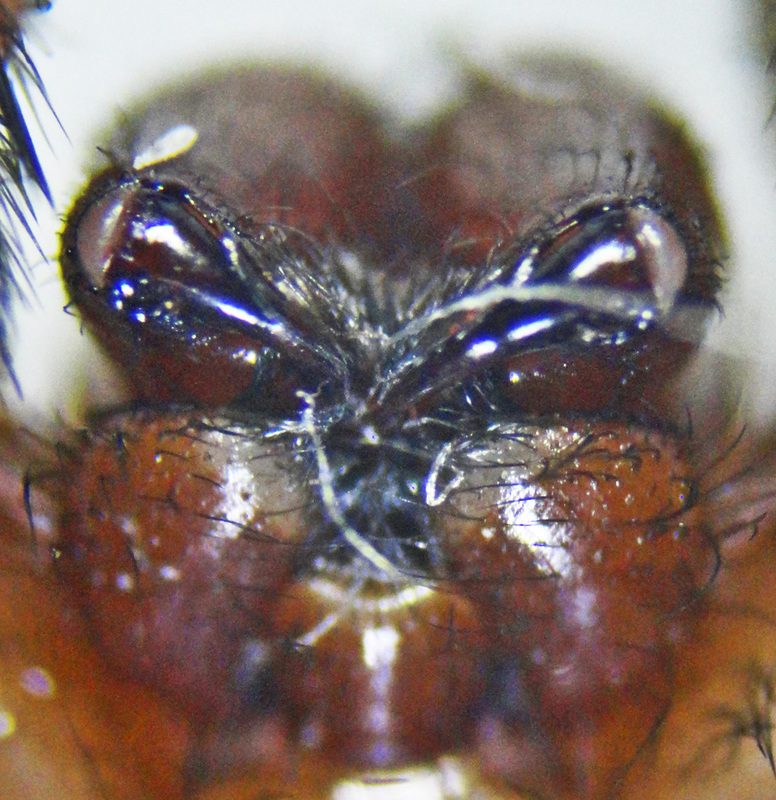 Applying a small amount of relaxant, such as glycerine, to the ethanol preservative, then allowing time for absorption by the spider’s tissues, permits the analyst to use forceps to reposition the legs without causing damage. Accordingly, the vial was set aside for several hours. Later, the specimen was withdrawn from the ethanol/glycerine solution and placed on a square of paper toweling to allow the ethanol to evaporate. 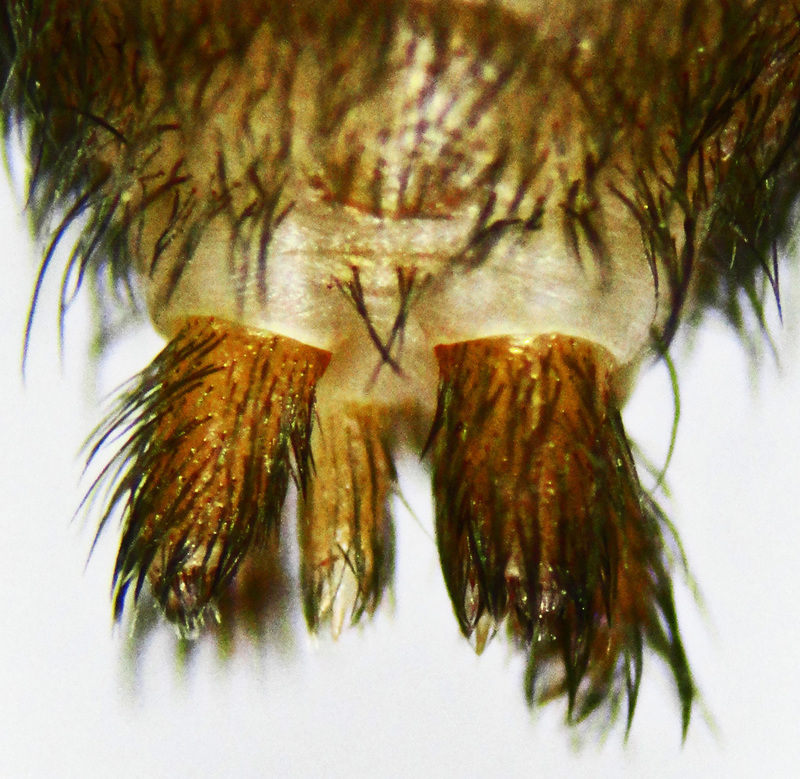 The process took some time, as the oils from the insecticide Annie used to kill the spider had pervaded the hairs of the abdomen. After an hour on the paper toweling, the spider’s body still appeared covered with an oily coating. 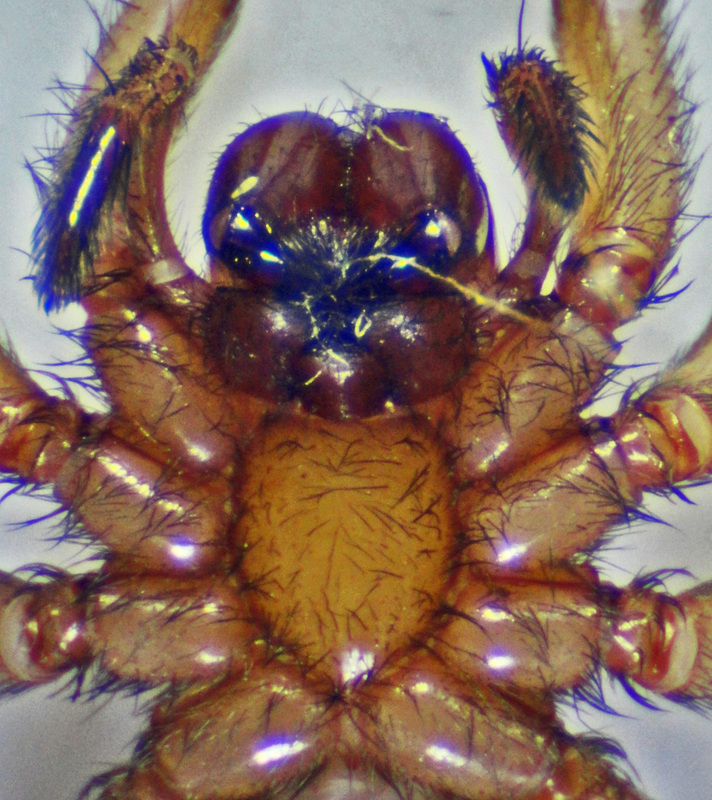 It was finally placed under the microscope in this condition, out of concerns that an additional wait would result in too much shrinkage of the abdomen to obtain a reasonable impression of the spider in its natural state. Jerry – I am not familiar with the Amphinectidae, but a brief online search suggests that our lone species in the U.S. is introduced. I could not determine if TX has confirmed specimens of Metaltella simoni, but to me the spinnerets do not match for the family you guess. 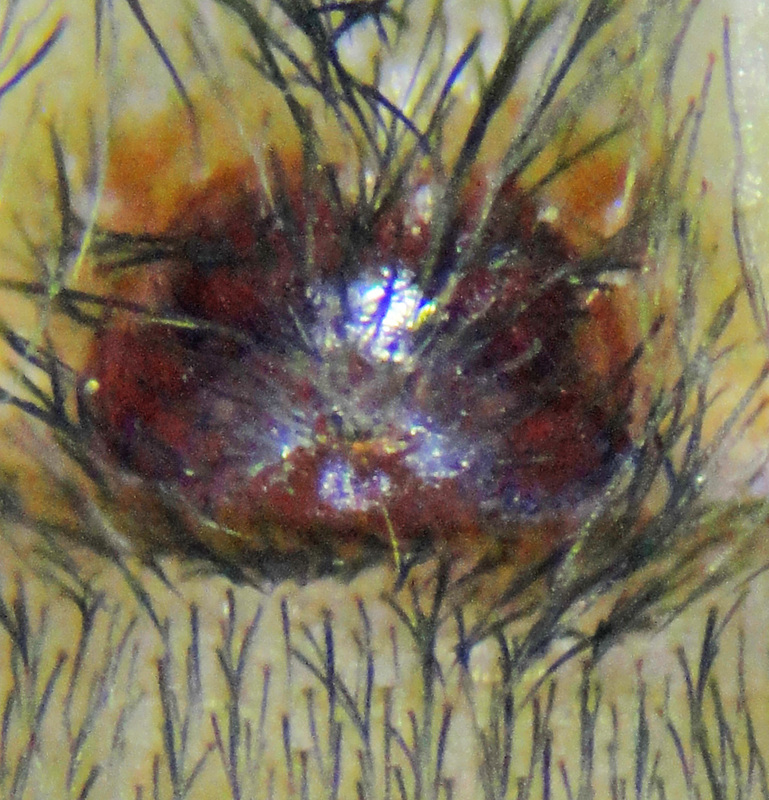 Spinnerets and eye pattern suggest to me that Clubionidae or Miturgidae are better guesses. 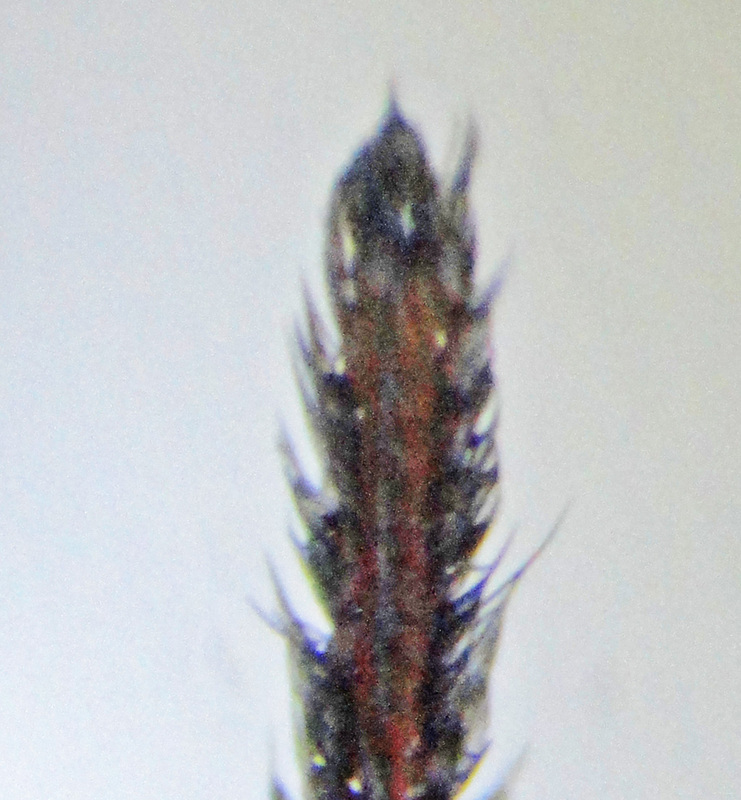 Although alcohol may alter things signficiantly, I also think your specimen lacks some dorsal patterning on the abdomen that M. simoni shows. There are some decent photos of M. simoni on the UC Irvine web site. Let me know what comes of it.